This 6.7mm Super-Wide Konig is a must-have in every astronomers case. It is our newest eyepiece and one that customers have been requesting for many years. It is now our highest power eyepiece, designed with the astronomer in mind. It took years to come up with the right lenses to meet our goals, but we did, and it's here to stay. This 6.7mm masterpiece can be used in any design scope from F-3.8 to F-20 due to the extremely flexible Konig design. Superb for planetary and double star work, with the added advantages of the long eye-relief of 18mm and an Apparent FOV of 70 degrees, for wide-field viewing of clusters and nebula. Compare this eyepiece, with nearly twice the FOV and as much as 4 times the eye-relief, to one of the high power plossls or high dollar orthos and they just cannot compete. Generous 18mm of eye-relief, 70° FOV, and superb multi-coated XL lenses yield some of the finest views you will get out of any type of telescope. Compare this eyepiece to others selling for 4-5 times as much and you will quickly see why it will become one of our most popular eyepieces. As you may notice in the picture, the 6.7mm SWA has a 1.25" bottom barrel and uses standard 1.25" filters; however, it also has a 2" machined step on the housing so it can also be used in "optimised" Newtonians that have extremely limited focus travel. Like two eyepieces in one. 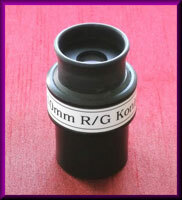 This 10mm Konig is one of the sharpest eyepieces you may ever look through. Superb planetary and double star performance due to superior research-grade lenses. Classic Konig is a 4-element design for excellent light throughput and contrast. The multi-coated research-grade lenses are, without a doubt, some of the finest lenses ever produced. Originally designed for extremely high magnification in microscopic research, before we had all the computerized image enhancing abilities we have today. Since they are no longer needed for microscopic research, the research-grade lenses are no longer produced. 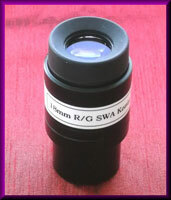 This eyepiece will give a lifetime of service and can be used with any design telescope that accepts 1.25" eyepieces. Also works great with any barlow, giving you even more options for viewing. 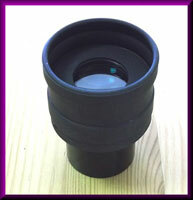 This 18mm 1.25 inch Super-Wide Konig eyepiece is a superb mid-power eyepiece with an amazing 67+ degrees FOV and fantastic edge to edge sharpness and contrast! Russell Optics makes this 1.25" 18mm R/G Super-Wide Konig with some of the finest lenses ever made, yielding 67+ degrees AFOV with superior light throughput, sharpness, and contrast. There simply is NOT a single eyepiece out there that compares to the performance this eyepiece, not even at TWICE the price! Bar NONE! The most popular SWA Konig of them all. The 19mm 1.25" super-wide Konig eyepiece is a superb mid-power eyepiece with an amazing 70+ degrees FOV and fantastic edge to edge sharpness and contrast! This has been our all-time best selling eyepiece for over a decade, BY FAR! That says it all. It is the Premier 4-element Konig design eyepiece that will absolutely amaze you with superb sharpness, contrast, and performance, at a fraction of what you would expect to pay for equal performance. Others that yield this performance sell for over $100-$150! 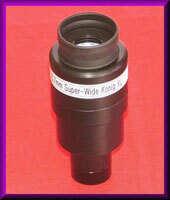 Russell Optics makes this 1.25" 19mm super-wide-field Konig with some of the finest multi-coated lenses available! With 70 degrees AFOV, this compares to ANY big-name eyepiece on the market today, at a fraction of the price! These are not research-grade or "XL" lenses from Japan; they are made with the finest lenses from Taiwan, now used by just about every high-end eyepiece on the market. Amazing value and performance for an excellent wide-field eyepiece. 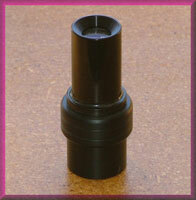 This eyepiece includes a rubber eyecup, 18mm eye relief, and is threaded for standard 1.25" filters. This is a cross-hair eyepiece that has many uses. Originally made by Meade for their 8x50 finder scopes, we redesigned it to function as a 1.25" eyepiece so it can be used in any scope. Use it in your Go-To SCT for star alignment, in a small refractor and make your own simple guide scope, or build your own giant finder out of any lens you have. This is the same cross-hair used in the giant finders we make here at Russell Optics. 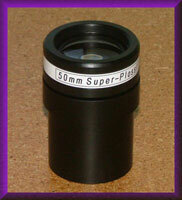 This long focal length Plossl eyepiece was originally made for use in eyepiece projection photography, but it ended up that more people bought them for visual scanning at super-low magnification. Extra long eye relief with super flat field of view. This eyepiece works in any scope that accepts 1.25" eyepieces, but it is suggested that you do not go below 35x in any scope that has a central obstruction (ie. : a Newtonian, SCT, or Mak). In a refractor, you can go as low of power as you like. Made with fully multi-coated lenses and threaded for standard 1.25" filters.